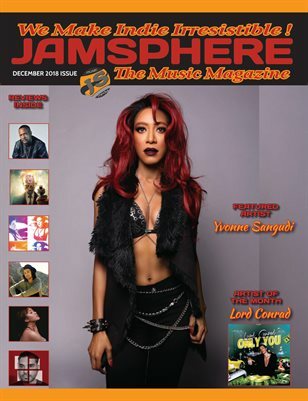 The December 2018 issue of our monthly Indie Music Magazine - FEATURED THIS MONTH - Yvonne Sangudi, Jordan Carroll, Forest Robots, Lord Conrad, Soupblack, PreacherMan, Kevin McWha Steele, Kill the Reflection, The Frost, Lunar, Parasyche, Glorious, Alisa Chirco - Jamsphere covers all news, reviews, interviews and events of the world's top independent music artists from all genres. Every month we choose the cream of the crop for our magazine, ready for digital download or to be delivered as a physical printed copy right to your door. Copies are also distributed to industry professionals and music's top tastemakers, as we continue our quest to make indie irresistible!